Has Gujarat moved on since riots? India's main opposition party has named controversial politician Narendra Modi as its prime ministerial candidate for elections due next year. Mr Modi, who has been chief minister of Gujarat state since 2001, has long been seen as a rising star of the Hindu nationalist Bharatiya Janata Party (BJP). In June, he was chosen to lead the party's campaign for the election. Mr Modi is credited with making Gujarat one of India's most prosperous states. But he is also accused of doing little to stop anti-Muslim riots in 2002 which left more than 1,000 dead - allegations he has always denied. In recent months he has been courted by international investors and foreign diplomats, and his image is that of a clean and efficient administrator who is corruption-free. A crowd of jubilant supporters gathered outside the BJP's headquarters in New Delhi ahead of the formal announcement of Mr Modi's candidacy on Friday. "I assure that I will leave no stone unturned in working for a BJP victory in the 2014 elections," Mr Modi said in a statement after being nominated. "I seek the blessings of the people in our efforts to free our nation of the turbulent times we are going through." Critics say his candidacy will shift the debate from the alleged scams and inefficiencies of the ruling Congress to Mr Modi's controversial persona, the BBC's Vineet Khare, in Delhi, reports. But supporters see him as a strong figure who can lead the BJP to power, after it lost the last two parliamentary elections, our correspondent says. A brilliant speaker, Mr Modi was chosen in June to lead the BJP's election campaign for next year. Some senior party leaders including former deputy prime minister L K Advani opposed his appointment. However, Mr Modi has massive support both within the party as well as among India's middle classes and business community, who see him as a charismatic leader who has turned Gujarat into an economic powerhouse. As a result, he was re-elected twice as the state's chief minister. Mr Modi also enjoys strong backing from senior leaders in the right-wing Hindu organisation the Rashtriya Swayamsevak Sangh (RSS). The RSS, founded in the 1920s with a clear objective to make India a Hindu nation, functions as an ideological fountainhead to a host of hardline Hindu groups - including Mr Modi's BJP, with which it has close ties. 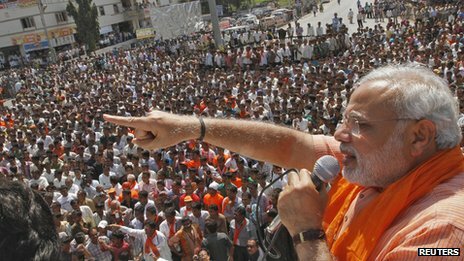 The RSS has a particularly strong base in Gujarat, and Mr Modi's links were seen as a strength the organisation could tap into when he joined the state unit of the BJP in the 1980s. 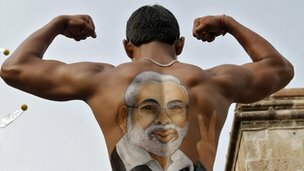 Mr Modi has a formidable reputation as a party organiser, along with an ability for secrecy, which comes from years of training as an RSS "pracharak" or propagandist, analysts say. Although Mr Modi escaped censure in the 2001 Gujarat riots, his close aide, Maya Kodnani, was convicted last year and sent to jail for 28 years. 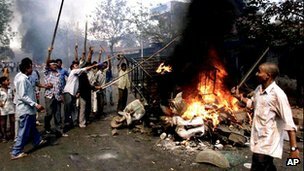 The rioting began after 60 Hindu pilgrims died in a train fire blamed on Muslims in the town of Godhra. Ms Kodnani was not a minister at the time of the riots, but was appointed junior minister for women and child development by Mr Modi in 2007. His critics accused him of "rewarding her with the ministership" for her role in the riots. Mr Modi himself has never expressed any remorse or offered any apologies for the riots, and many Muslims displaced by the violence continue to live in ghettos near Ahmedabad, Gujarat's largest city and commercial capital.